At various junctures in the process of peace-processing, Israeli leaders have waxed righteous about the need for the Palestinians to “recognize Israel as a Jewish State.” This demand is absurd on many levels, from its implicit requirement that Palestinian leaders give their seal of approval to the maintenance of Palestinian-Israelis’ second-class status to its rhetorical slight-of-hand distraction from the fact that Palestinian leaders have already recognized Israel’s right to exist as an Israeli State. But there is also an even more basic absurdity to this demand: Israel is not a Jewish state. Yes: Israel is a state in which people who are Jews are given more rights and privileges than people who are not Jews (let alone the Israeli-controlled West Bank and East Jerusalem, where the majority of non-Jews are barely given rights and privileges at all). Yes: Israel is a state in which archaic, hyper-masculine and exclusionary readings of Jewish texts are wielded against women and non-Orthodox Jews, as well as against non-Jews. But Israel is not a Jewish state in any value-based — or valuable — way. The Torah, the backbone of the Jewish people and religion, has a wide range of commandments and imperatives, some chauvinistic and some universalistic, some peaceful and some violent, some which contradict others. However, the most repeated commandment in the Torah, appearing in different forms 37 times, is the imperative to “love the stranger,” for we were strangers in the land of Egypt. In addition to this religious dictate, Jews over history and throughout the centuries have learned in the most difficult — and sometimes horrific — ways what it means to be a stranger. The Israeli State — and to be clear, I am not referring to the State as synonymous to Israeli people, many of whom indeed practice some form of loving strangers — the Israeli State has not only failed at any sort of “loving the stranger,” but it has, especially recently, constructed policies that are hateful and oppressive to “strangers” living in our midst. The events of the past few weeks have proven this in especially stark terms, specifically those related to Israel’s actions against African asylum seekers from South Sudan, many of whom have been recently rounded up in preparation for deportation, and the entire Palestinian village of Susya located in the South Hebron Hills, slated to be entirely destroyed in the near future. We, Israel, were strangers in the land of Egypt in our collective past. People from South Sudan (and from other parts of Africa, especially the violence-torn Eritrea), seeking refuge from Pharaonic oppression, have walked through Egyptian deserts, many of them facing horrific abuse at the hands of both Egyptian authorities and human traders. When they arrived in Israel, a country built by refugees, they were thrust into ghettos and systematically denied the status of asylum-seekers. There have been recent acts of violence against African refugees in Tel Aviv and Jerusalem, including the burning of a Jerusalem apartment inhabited by asylum seekers from Eritrea and a mob attack against refugees and anyone who looked like refugees (read: black folks) in South Tel Aviv. The government provides no services whatsoever to the African asylum seekers and goes so far as to print visas denying permission to work. Netanyahu’s solution to the “problem” is to build a gigantic detention facility isolated in the Negev Desert, where 10,000 “infiltrators,” as the government calls the asylum seekers, will be housed. Over the last week, Israeli authorities have begun “rounding up” South Sudanese in preparation for deportation. The first flight carrying South Sudanse back to Sudan was slated to take off on Sunday. 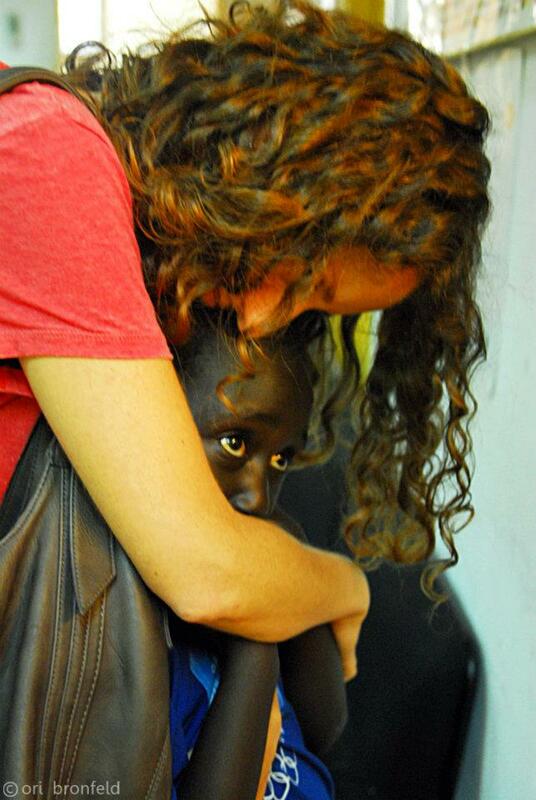 [Israeli activist hugs Sudanese kid before the latter is deported by the former’s government. Photo by Ori Bronfield]. Forced interment-qua-deportation of African asylum seekers is Israel’s leader’s version of Jewish “humane” tradition. I refuse to accept such a perversion of my history, religion and culture. Israel is not a Jewish state. And then let’s travel briefly to the other side of the “green line,” the internationally recognized border between Israel and maybe-future-Palestine that has lost virtually all meaning as Israel has intensified and entrenched its quasi-annexation of Area C (over 60 percent of the West Bank and home to almost all Israeli settlements). A small village named Susya, located in the area of the South Hebron Hills, has recently received demolition orders. For the entire village. Again: The whole village is slated to be demolished. Israel has sought to couch its actions in the façade of legalism. After all, the houses and buildings in Susya, like most houses and buildings in the South Hebron Hills, like most houses and buildings in all of Area C are built “illegally,” that is to say, without permits from the Israeli Civil Administration. Not only does this claim distract from the fact that the whole occupation is, itself, illegal, in every meaningful sense of the word “law,” but it obscures the fact that on average, according to Israeli planning rights group Bimkom, from 2000-2008, an average of 95 percent of Palestinian requests for building permits in Area C have been rejected. Four months ago, the Regavim Organization filed a petition to the High Court demanding that our village, Susya, be destroyed. They refer to it as an “illegal outpost” and claim that our village presents a security threat. Last week there was a hearing in the Israeli High Court. They call my village an illegal Palestinian outpost. But these have been our lands since before the establishment of the State of Israel. My father is older than your state and I am not legal on my own land? Nasser and the people of Susya were informed by the Israel Civil Administration on July 12th that 52 structures, virtually all that is left of Susya, including a kindergarten, houses, wells and a medical clinic, will be demolished in the near future [note: Rabbis for Human Rights (with whom I am active) is preparing a petition to the Israeli High Court appealling against the demolition orders]. Israel is planning to destroy Susya because Israel aims to take over the land on which Susya sits, and to “encourage” Palestinians in the South Hebron Hills and in Area C in general to move to major Palestinian cities. It is as simple as that. Jewish history has been transformed by Israeli policy from a rich, complex legacy of human suffering and triumph to a stale combination of archeological findings and Biblical quotes, wielded together as weapons against human beings who happen to not be Jews, to expel them from their homes and to strip them of their land and their dignity. I refuse to accept such a perversion of my history, religion and culture. Israel is not a Jewish state.